Espinosa Cigars has emerged in the last five to ten years in my mind as a company making some of the most unorthodox and flavorful cigars on the market (La Bomba, the core Espinosa line, etc). It’s with that in mind that I approach my review of the Espinosa Reggae, a cigar released by the company in 2017. 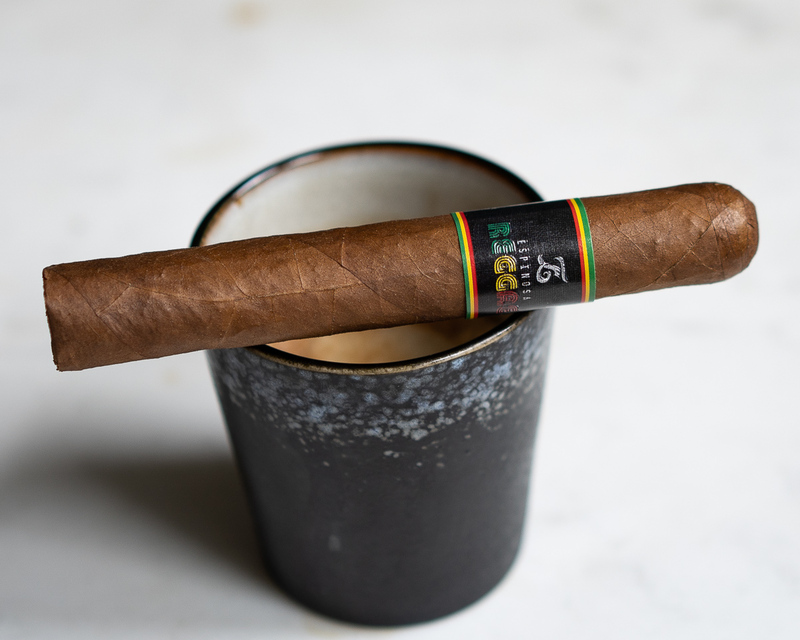 The Reggae, which I picked up at Sky Tobacco in Jersey City, continues the company’s flashy trend with an eye catching band design and some interesting Jamaican filler tobacco. I really love the presentation of the Reggae. The combo of red yellow, and green set against dominant black is very eye catching, but still tasteful. The brown Ecuadorian Rosado wrapper has a slight lightness to its color, and the texture is mostly smooth save a very fine sandiness. The cigar is packed consistently the length of the cigar, and there’s a fair amount of give when squeezed. Off of the foot are aromas of savory spiciness, dry cedar, and slightly sweet grass. The draw is good if a touch loose, about a 6/10 in terms of level of restrictiveness, and the cold draw reveals white pepper, cedar planks, and slightly sweet oak. 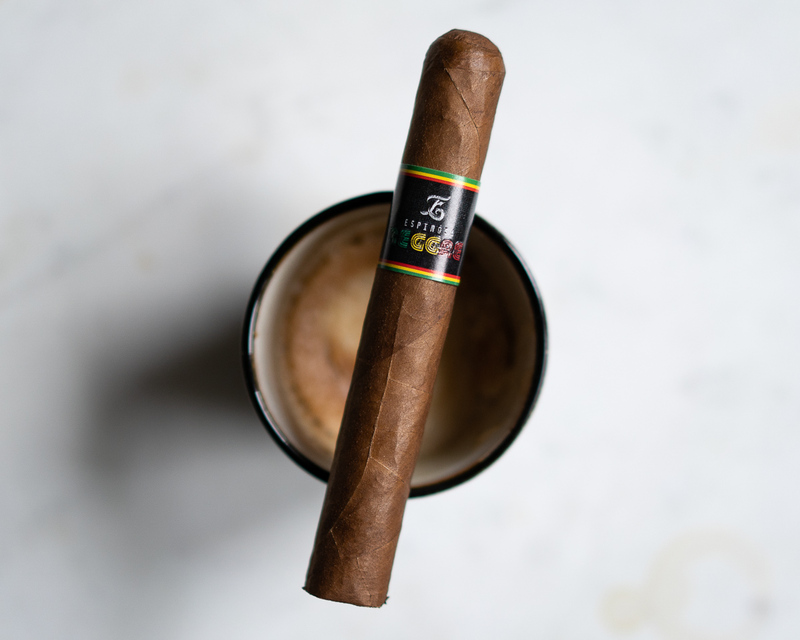 The Espinosa Reggae opens with medium bodied smoke and a very interesting balance of sweet, spicy, tangy, and creamy notes. It’s hard to pick the flavors out, but about ten minutes helps me narrow them down to spicy cream, tangy fruits, black and white pepper, dry wood, and pungent vegetal notes. The retrohale is unique as well, with a combo of sweet and sour sauce, leather, and spice. It’s all very complex, but the jury is out at this point as to whether the flavors harmonize. Smoke production is thankfully excellent. The first ash drops at an inch in to the Espinosa Reggae, and at this point the flavors shift, with strength and body both at about medium. Vegetal notes are still at the forefront, with a new Wasabi spice note playing nicely with the creamy texture of the smoke. Still, it’s a strange profile and I’m not quite sure what to think. As the Espinosa Reggae burns past the second third mark, there’s a fleeting oak note that makes an appearance, and the vegetal notes shift to become somewhat burnt tasting (not so good) There’s also a heavy white pepper that coats the palate along with a secondary brown sugar note. The burn remains almost completely straight. 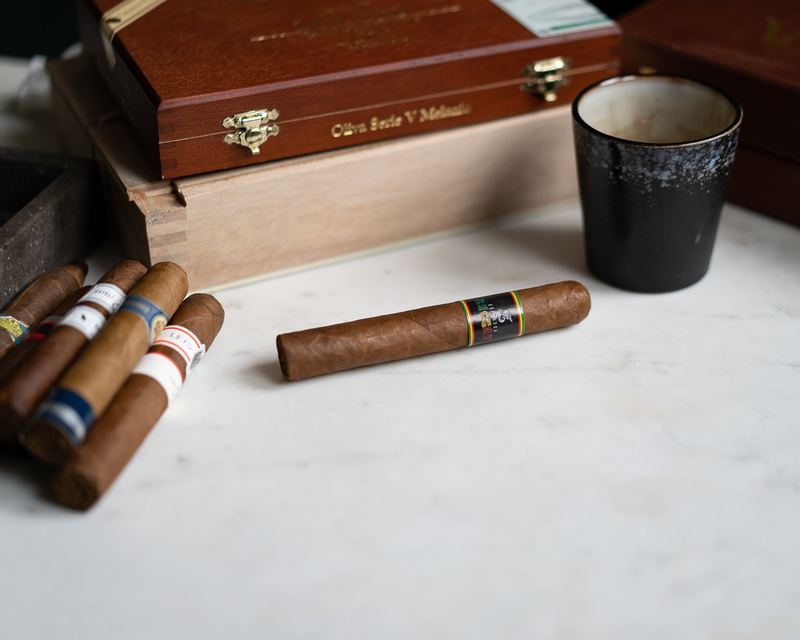 The cigar smokes mostly this way until the beginning of the final third, where the balance in the profile shifts toward smooth sweetness and the bitter vegetal notes take a welcome back seat. Secondary notes include leather, brown sugar, and smoky wood. The final inch retreats back toward heavy smoky vegetal, black pepper, and Wasabi. The temperature of the smoke at that point rises quickly, providing a good stopping point. The Espinosa Reggae is quite unorthodox as flavors go, which isn’t necessarily a problem. The flaw is that what the Reggae has in complexity it lacks in balance and harmony. For most of the smoke, the flavors rarely complement one another. I’d be curious to know how much of this is due to the Jamaican tobacco, but either way, Espinosa has much better product on the market. Brand evangelist, digital marketer, cigar and spirits expert specializing in consumer tasting and educational events. Matthias made the long trek from his hometown of Portland, Oregon to New York City in 2007, and in nine years has hosted more than 120 events and helped promote and launch dozens of cigar and whiskey brands in the U.S. In 2016, he joined the Cigar Journal Tasting Panel, blind-reviewing pre and new release cigars. How Much Does a Good Cigar Cost?